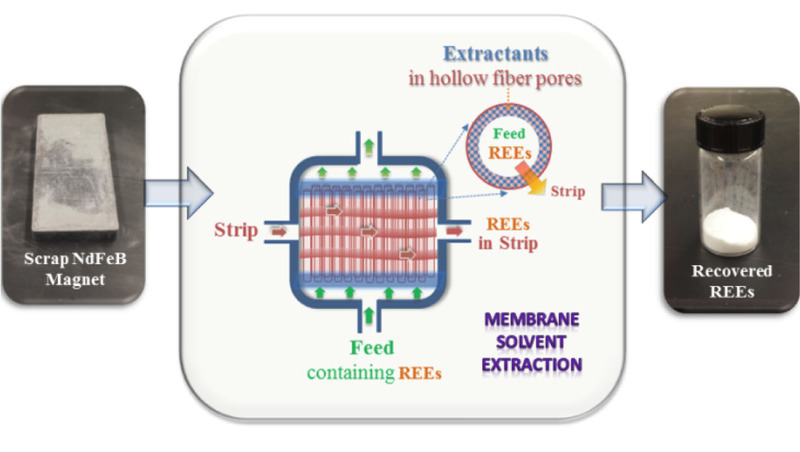 Diagram of membrane solvent extraction system developed by CMI researchers at ORNL and INL. The first license for a CMI invention was granted for a recycling process developed by CMI researchers at Oak Ridge National Laboratory and Idaho National Laboratory. They have applied for a patent for "Membrane Solvent Extraction for Rare Earth Separations." During the first two years of CMI, researchers created 34 invention disclosures. For nine of those, patent applications were filed. The list of CMI invention disclosures is available online.